We all made the long drive in a timely fashion and by 11.30am, we were heading up through the old mine buildings towards the Smallcleugh mine entrance leaving Emma, who had sustained a double ankle injury in a fight with the bottom stair of a spiral staircase, to her own devices in the car park. 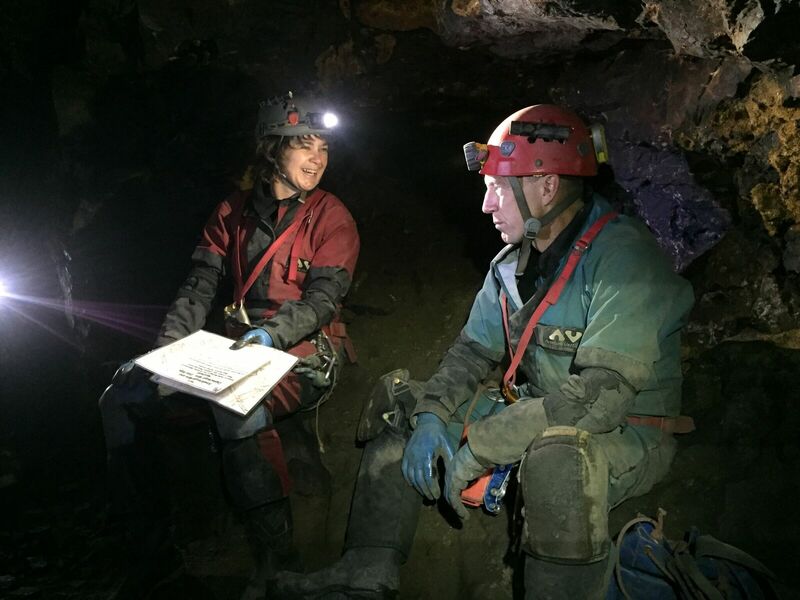 On the way, Andy managed to persuade some unsuspecting visitors to join one of the mine society’s Open Day trips and we took the opportunity to introduce ourselves to the volunteers from the Mine Conservation Society and to bag our cake choices for our return. We were also advised to avoid Luke Hall’s sump as the metalwork had collapsed and the walls were in danger of joining the metalwork. Smallcleugh horse level was followed through to Smallcleugh Flats. (I thought we were Wheel Flats & promptly turned everyone westward along a passage that led directly to Luke Hall’s Sump!) Phil continued along the main passage and discovered a sign hailing entry to Wheel Flats and so we continued without further ado to the infamous Ballroom Flats. The main mineral in evidence was galena—as you would suspect in a lead mine. The arched passages, handcrafted by mine workers, were quite spectacular and large enough to only require limited stooping (except in areas of collapse), and the water was rarely over ankle deep—so a comfortable start to our journey. After Ballroom Flats and a Darren photo shoot, the size of passage decreased to a belly wriggle where crawling in the roofs of arched passages was necessitated due to infill. Once more we encountered Luke Hall’s sump and thereafter we peered expectantly into each sump looking for the ‘only rigged sump on that level’. A 17m descent down a tube brought you out on the edge of Proud’s Flats where a slight swing was needed to reach secure ground. We all investigated the Flats and the 3 obvious passages, discovering wheels, shovels, an almost entire carriage and an ammunitions box. 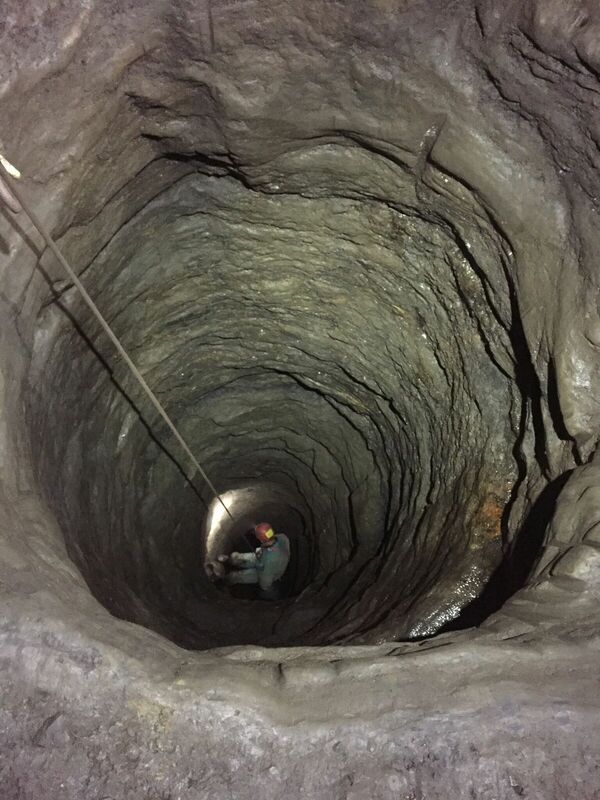 A ladder had been installed the previous week to replace the final rope pitch and henceforth the water was followed over a good kilometre of passage in Rampgill mine to exit in the car park. The formations and mineralisation on this long section of passage were magnificent and put the Painters Palette to shame. (The collection of bottles at Whiskey Bottle Junction was something to be admired as well). The final wow factor was the Brewery Shaft, just over 100m deep. 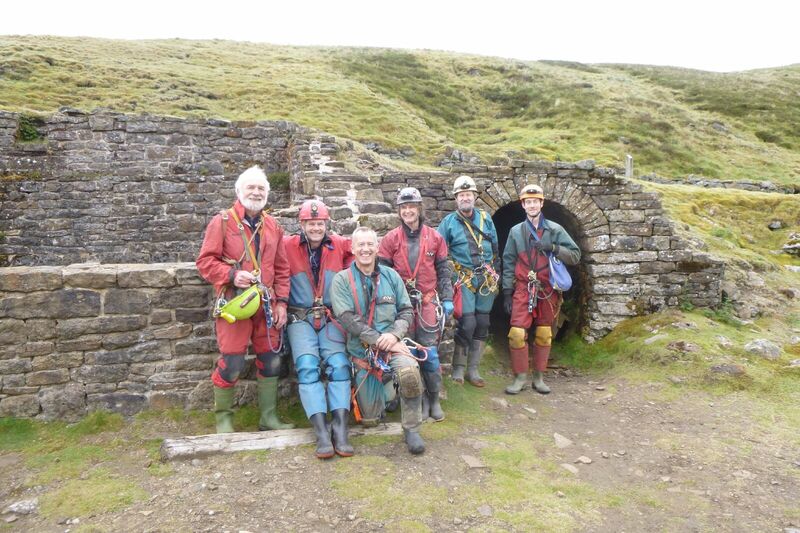 A trip taking around 3h20 was ended splendidly with homemade cake and a cup of tea for the whole team (including Emma) with the Mine Society. Andy found a contact who was willing to open the Brewery Shaft for a future KCC trip and, lured by cake, we started to plan a 2 day excursion to coincide with a future Open Day….the potential agenda comprising a longer through trip on the Saturday and a descent of the 105m pitch, ascent to Rampgill and exit via Smallcleugh on the Sunday. 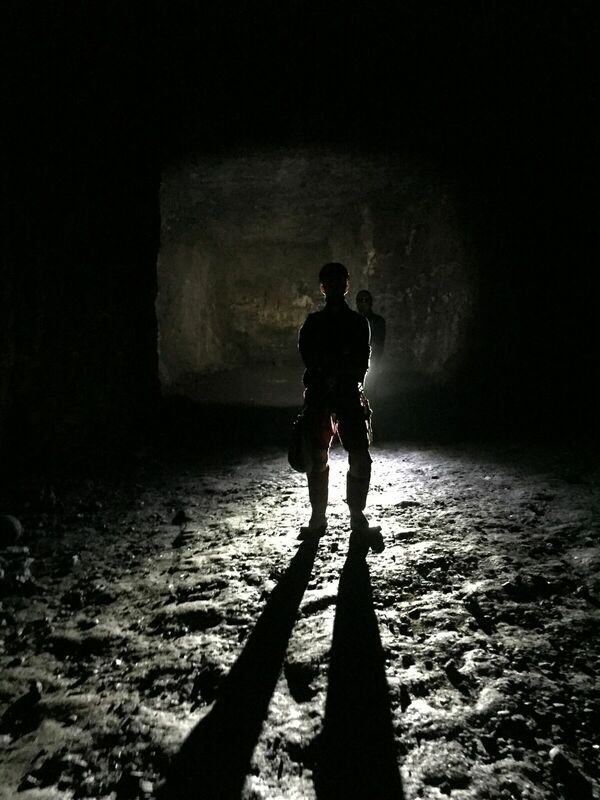 Unfortunately, it does seem that bunkhouse accommodation at the mines is not available on the Open Day weekends so we will have to rethink potential dates. If interested in this possible excursion, please get in touch. It would seem useful to remind club members that mine artefacts (as with natural formations in caves) should be treated with respect. 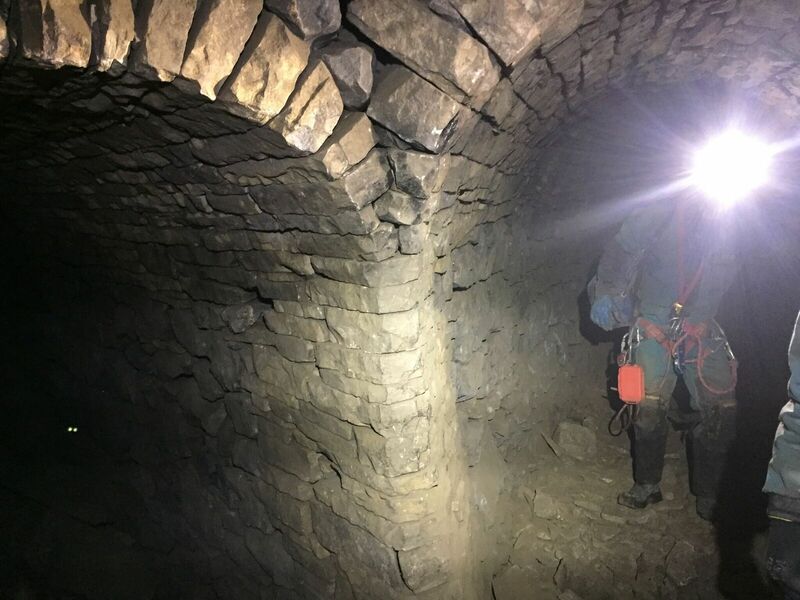 They definitely cannot be replaced once damaged/destroyed and we are very fortunate to be able to go underground to see implements in positions where they were once used.